Hi! 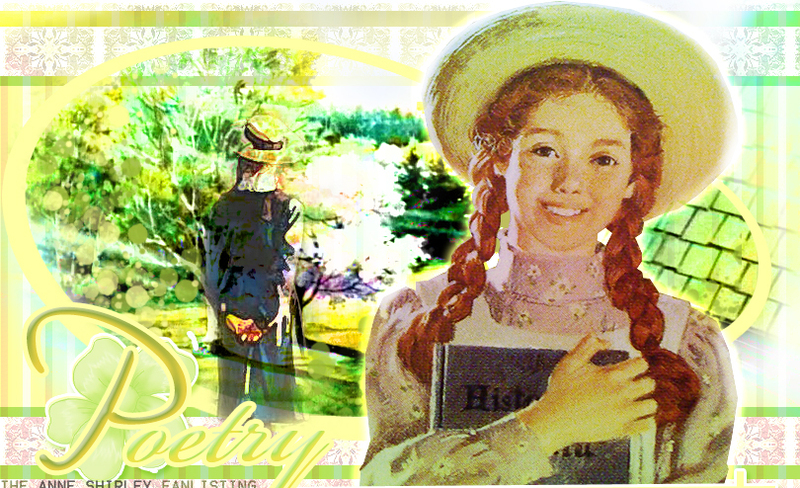 Welcome to "Poetry", the TFL approved fanlisting for Anne Shirley , the amazing, dreaming and funny main character from the series Green Gables, created by the incredible Lucy Maud Montgomery! Anne is absolutely the most important character from a novel series for me, she's the emblem of the revolution of the first years of the 1900 for girls and women. She lives in a place that isn't a big city but a little country, Avonlea, with characters close to her that aren't just friends or girls like the best friend Diana, but even women and men as Marilla and Mathew. Anne's strong personality is the key to reach every goals she wants. She's smart. But the most important side of her is that she's a dreamer. Anne can be the truth like a dream, and she can live there, thinking of fantastic adventures and situations, even with her friends and dears. Anne be make all her thoughts as poetry, and she speak a very complicated language for a child of 11 years that is an orfan grew up too fastly. I think that reading Anne's advenure is a sort of "terapy of the smile" because we can't follow her adventure without smiling. A special thanks to Angela who kindly sent me the old members list. :) Thank you very much, dear!! Please, choose a link from the left to fully access the site, and if you're a fan of Anne, feel free to join her fandom! Anne of Green Gables series is the property of Lucy Maud Montgomery, all rights reserved. This is a fan-site and I don't intende to violate them. Layout & contents © Dorothy.